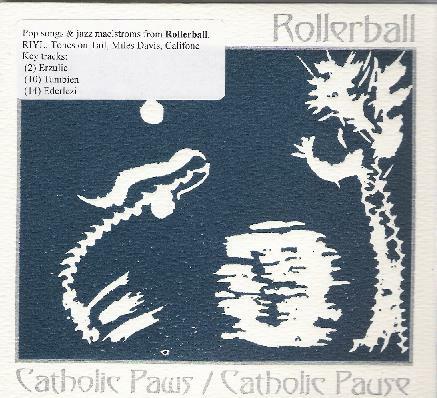 Rollerball - "Catholic Paws/Catholic Pause"
Catholic Paws/Catholic Pause is Portland, Oregon based Rollerball's 11th album and their third for the Silber label. The core of the band is a quintet, playing guitar, bass, keyboards, drums & percussion, accordion, saxophone, clarinet and vocals, plus numerous guests on drums, vocals, cello and a variety of horns and winds. I've heard Rollerball's last several releases and have learned that it's hard to know what to expect from these folks from one album to the next. But they've never failed to at least intrigue, and often delight, with their well crafted combination of varied and contrasting elements into a unique and stimulating whole. Ok, lots happening here, and it often changes radically from one track to the next. There are 15 relatively short tracks on the CD. Among the highlights are "Quench" and "Mantis Segue", which have the most devastating vocals on the album. "Quench" features haunting, whispery vocals (in Italian) against an avant-garde free-improv/classical styled rumbling of horns, strings, drums and drones. "Mantis Segue" is similar but instead of horns we've got prominent percussion, scratchings and electronics. "Erzulie", "Tambien" and "Quad Four" are pop songs based in avant-prog rock with jazz elements and, particularly on "Quench", seductive melodies. "Sores" is a fun, strange song with nutty lyrics and vocals that are a dead ringer for Little Fyodor. "Tipping The Tree" is a very cool mixture of sultry lounge jazz, Dub, dance grooves and spacey atmospherics. "Break In Your Neck" is similar but based in New Orleans jazz. Very hard to describe but pretty wild and captivating stuff. "So This Is That?" consists of cosmic space keyboards and freaky jazz horns swirling within a light Dub coating. This is one I would have really like to hear further developed beyond its mere 3 minutes. "Maime" is the 16 minute closing track and starts off like it's going to be a lengthy synthesis of everything we've heard on the album so far. But after a few minutes we get silence. Ok fine… when bands do this you can usually predict that at some point some secret treaty will kick in, and sure enough around the 8 minute mark the music starts again and it's a quirky, oddball kind of jazz jam with elements of Sun Ra, free-jazz and experimental free-improv. The sound isn't so hot and I'm guessing it's a recording of a live performance. In summary, if these descriptions sound like Rollerball are stylistically all over the place, they really aren't. There's variety to be sure, but the band have set their sights on a handful of ideas which they've developed, molded and mutated into the enjoyable and remarkably creative set of music that Catholic Paws/Catholic Pause has to offer. I can imagine this appealing to a varied audience… avant-garde free-improv fans who like an injection of melody and song, free-jazz lovers with eclectic tastes, and avant-prog/RIO fans interested in something with a more experimental edge.